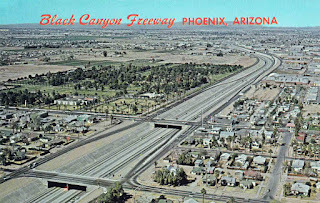 Phoenix, Arizona utilizes freeways and several types of surface streets for its traffic. 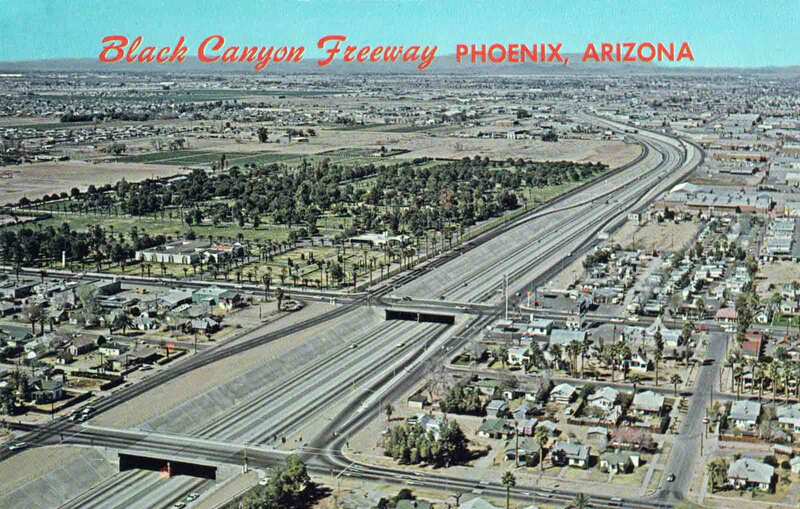 A reluctance to build freeways in the 1970s and 80s was overcome in the 1990s and is the reason why Phoenix has some of the widest, best-designed, and safest freeways in the country. In addition to these modern, well-designed freeways, the valley boasts very wide main streets. All of these streets have at least two lanes in each direction, and a dedicated turning lane in the center. This allows these streets to be used as "mini-freeways". No parking is allowed along these main roads, and most have long "exit ramps" for smooth turning into shopping centers, etc. Although it can seem confusing at first, if they are treated with the same respect given to freeways, they are fast and safe. The far left lane is the fast lane, and slower traffic should stay to the right. The speed limit is posted at 40 miles per hour, but, like on the freeways, five to ten miles per hour above that is still considered safe. While there is no minimum speed on these main roads, if for some reason you need to keep your vehicle below 40 miles per hour, it is best to stay off of them. Luckily, there is a place for slower traffic, which bisects the main streets, which are one mile apart, at half-mile increments. The half-mile streets are also extremely wide, and usually have a dedicated left-turn lane. These streets do allow street parking, and many include a lane for bicycling. The speed limit for the half-mile streets is 30 miles per hour, and that speed limit is usually held. While passing schools, the speed limit is reduced. Drivers in Phoenix respect the speed limits on these streets. The neighborhood streets, which are still very wide, have a speed limit of 25 miles per hour, and usually have traffic calming devices, such as speed bumps. The wideness of the streets and the excellent visibility tempts drivers to go too fast, but these are streets with children, bicycles, vehicles backing out of driveways, etc. so these routes are best used only when entering and exiting neighborhoods. Although Phoenix has a reputation as a tourist community, the vast majority of the people using Phoenix streets and freeways are the regular commuters. If you are a winter visitor, it's courteous to avoid the Phoenix freeways and streets during rush hour. Also, the width of the streets and the number of lanes can often make turning left onto them difficult, and potentially dangerous. Treat these wide streets like mini-freeways and you will be safer. And just like freeways, the main streets of Phoenix are no place for bicycles and pedestrians. It's not illegal to ride a bicycle on a main street in Phoenix, as it is on the freeway, but the narrowness of the lanes and the speed makes it difficult for drivers to accommodate you. Again, if you are using a slow-moving vehicle, stay on the half-mile streets. If you come from somewhere that has congested traffic, you may be surprised at how fast the traffic moves in Phoenix. It all comes from outstanding engineering, and utilizing the wide open spaces of Arizona.